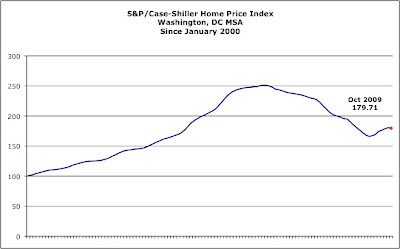 The S&P/Case-Shiller Home Price Indices report for October 2009 was released a few days ago. The report shows "that the annual rate of decline of the 10-City and 20-City Composites improved compared to last month’s reading." “The turn-around in home prices seen in the Spring and Summer has faded with only seven of the 20 cities seeing month-to-month gains, although all 20 continue to show improvements on a year-over-year basis. All in all, this report should be described as flat.” says David M. Blitzer, Chairman of the Index Committee at Standard & Poor’s. “Coming after a series of solid gains, these data are likely to spark worries that home prices are about to take a second dip. Before jumping to conclusions, recognize that the one time that happened at the beginning of the 1980s, Fed policy saw dramatic reversals, which is very different from the stable and consistent Fed policy we have today. " "...As of October 2009, average home prices across the United States are at similar levels to where they were in the autumn of 2003." Of note for the DC area is that sales prices declined in October compared to September, the first month/month decline since March. 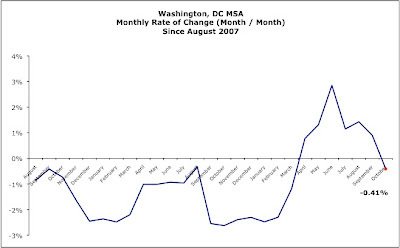 Moreover, the rate of month/month price increases peaked in June and the slope of price increases turned negative. While we may bemoan the negative turn of events, homeowners should consider ourselves lucky compared to Las Vegas: prices there have declined for 38 straight months and are now about 5% higher than those of January 2000. Talk about a lost decade! On another note, this is my 90th - and last - post for 2009. I hope you've found this blog to be informative and helpful, if not entertaining [who else in the blogosphere talks about Bagatelle-brunching-bonus-bagging-too busy-to-meet-with-the-President-who-saved-our-asses Wall Street idiots?]. 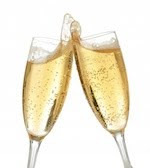 I'd like to wish each of you a safe and prosperous 2010! Thanks for your great blogging Keith--I hope you have a great 2010 as well! Fabulous graphs. 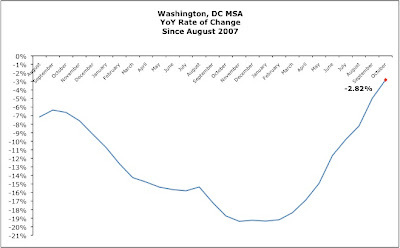 You do such a good job reporting the DC area data--best on the web. Thank you, and happy new year!